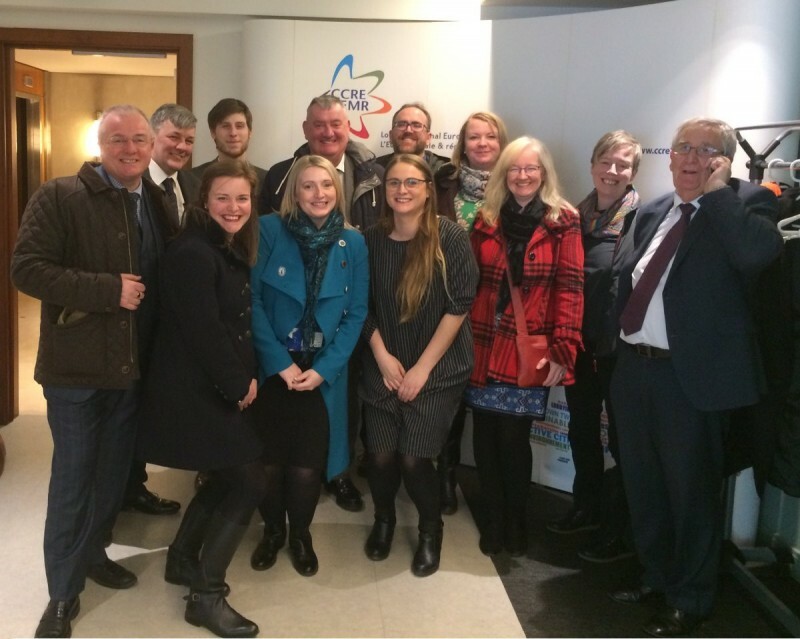 At the end of March, the ESEC Policy Board and Officer Group went to Brussels on a Brexit fact-finding mission, the objective of the trip being to investigate how third country local authorities engage with the EU institutions. Board members included Cllr John Reynolds (Aberdeen City Council), Cllr Ben Lawrie (Angus Council), Cllr Will Dawson (Dundee City Council), Cllr Altany Craik (Fife Council), Cllr Peter Barrett (Perth and Kinross Council) and Cllr Scott Farmer (Stirling Council). The three day meeting schedule was facilitated by Scotland Europa and CoSLA, and the delegation met with the Committee of the Regions (COR), the Scottish Government, Eurocities, the Council of European Municipalities and Regions (CEMR), the Norwegian Association of Local and Regional Authorities, Oslo Region European Office, the East of England European Partnership, MEPs David Martin and Catherine Stihler, the Swiss Mission to the EU, DG Regio of the European Commission, the North Sea Commission, and the Conference of Peripheral Maritime Regions (CPMR). 3rd country status does not necessarily mean pulling up the drawbridge to the EU. Norway has a large presence in Brussels and its local government association provides training and job shadowing opportunities to councillors in order to help them better understand the EEA and EU. Switzerland also has a large presence, with 55 members of staff at the Swiss Mission. Brexit is high on the agenda for many other local authorities and regional bodies in the UK, with a particular focus preparing for what happens post-2020, and ensuring the collective voices of local government is taken into account during the design of the UK Shared Prosperity fund, which will replace the bulk of EU funding. Many 3rd countries participate in transnational programmes such as Erasmus+, Interreg and Horizon 2020, although there are different models for doing so. In order to make our case for continued participation in these funds post-Brexit, we need to showcase our many successes in these projects, and the impacts they have had via case studies. Discussions around the next EU budget (2021-28) have already started and will begin in earnest when the European Commission adopts its proposals on 2 May. Even though we will no longer be EU members when this budget comes into force, we should still feed our views and expertise into the negotiation process. We are drafting a more detailed report from our visit. In the meantime, you can see more of our thoughts on the trip via our Twitter posts.